Call up a Jewish community center these days, and you Il likely find a mah-jongg game about to convene. Seattle, Albuquerque, Nashville, Denver, Stamford, Albany, . . . and what seem to be hundreds more. Mah-jongg is back. 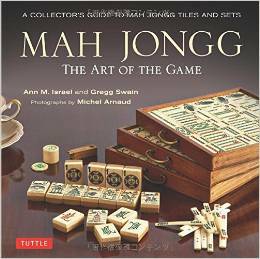 But before mah-jongg was Jewish, it was the craze of non-Jewish America. Introduced in the early 1920s, mah-jongg was exotic and fabulous. A set, notes a new exhibition on the game, “added to the sophisticates repertoire. . . . [It] had the appeal of simulating an encounter with another culture. ” “Project Mah Jongg, ” running through January 2011 at New York’s Museum of Jewish Heritage – A Living Memorial to the Holocaust, traces the Jewish fascination with the game. Jewish women, notes curator Melissa Martens, embraced the game as an “acceptable” pastime that had been “vetted” as American. Quickly, they began playing it in their living rooms and in community centers and synagogues, using the game to raise money for Jewish causes. GROSSMAN – Beatrice (Bunny). A woman of grace and kindness, celebrated by her many friends and adored by her family, has left us in her 90th year. . . . Beloved wife for over 60 years . . . Bunny will be missed at the mah-jongg table . . .
EMMER – Ruth. Died August 6, 2006 in Seattle, WA at the age of 85 __ She was a founding member of the Modernettes, which started out as a group of girls and developed into a group of women who stayed in touch with each other for over SO years __ She loved to play Mah Jong. Every week, for 30 years, my mother-in-law, Rachel Stern, played mah-jongg with friends in her home in Toronto. Tuesday afternoons meant candy magically appearing on living room tables, a special lunch of chopped egg or tuna, and a mom who was often in a hurry to take a bath and change out of her housedress into one of several pantsuits. Over the 62 years of their marriage, her husband, Marty, and the five Stern children must have witnessed more than 650 games of mah-jongg, each of which took place at a bridge table set up squarely in the center of the living room of the Stern’s single-family home in their upper-middleclass neighborhood. And that would have been just a quarter of the games played: Chelly, as my mother-in-law was called, and her friends Ethel, Sonia, Ruthie and Toby probably played 2,500 games of “mahj” together, rotating living rooms every week. On the surface, the intimate space of Chelly Stern’s mahjongg table was an ideal setting for female companionship. And because three members of the group were Canadian-born, it also became a space where new immigrants Chelly and Toby could learn Canadian customs in what felt like a warm and welcoming Jewish environment. At the mid-point of the twentieth century, when most middle-class mothers’ workplaces were kitchens and laundry rooms, and dads routinely drove off to work in their offices downtown, the women-only game clearly reflected a in which women were expected to “dress, look and act” both feminine and motherly. 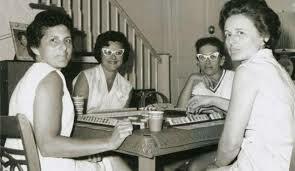 As Betty Friedan so famously wrote in the 1963 The Feminine Mystique, “a thousand expert voices applauded their femininity.” The gaming table was therefore a space of conflicting meaning and competing ideals, the site of both sisterhood and the suppression of feminist ideals. While the games women have played changed over time, some aspects remained stubbornly the same: the well-appointed card table set up in the nicest room in the house, the display of finery, the rotation of hosts, the camaraderie among women. Gaming was not some kitchen-table enterprise, done in slippers and between chores, but a high-end performance, with finery of all sorts part of the set. Although mahj must have been entertaining, one has to wonder how and why it took such hold among Jewish middle-class women. Was it something about the game and its physicality that made it so pleasurable? And, in what ways did this pleasant experience constitute a gender dance, choreographed by the pressures of a 1960s social and political power matrix and articulated in both ethnic- and gender-specific ways? From personal observation, I believe Mrs. Schwartz’s explanation rings true: because mah-jongg is a somewhat mechanical game, it is entirely possible both to play it well and to engage in personal conversation at the same time. And the game’s gentle physicality – female hands touching each other across the tight landscape of the table-top – is important in understanding its popularity. Enhanced by the warm sense of an occasional personal touch across the rich surface of the colorful tiles, this table top seems to be an ideal site for a sense of belonging and sisterhood. Then, of course, there was the requisite food that enhanced the game so much. Every mahj afternoon in my mother-in-law’s circle began with the consumption of a “light lunch” of salad, daintily cut party sandwiches, dessert, tea and coffee. The special lunch was laid out upon the best tablecloth, and served using the hostess’s finest china and silver. When the game was in play, most mah-jongg gaming tables were accessorized with snacks and drinks. Remarkably, the choice of two candies – bowls of liquorice allsorts and bridge mix – seems to have been ritualized to the point of being virtually a North American standard. Cash also played a role in these women’s embrace of mahjongg. The gaming table was a place where they could make or lose their own money – even if the total at the end of the game was no more than three or four dollars. In an era when many housewives received weekly allowances of spending money doled out by their husbands, a woman might feel some pride in “earning” something, no matter how little it was. At a time when most North American middle-class women were spending a majority of their time at home, consumed with issues of domesticity, it is not surprising that many sought relief in female companionship. An afternoon or evening of mah-jongg with close friends was a genuine escape from the tedious confinement of home-making, even if it took place in one’s own home. When seen at a distance of some decades, the mah-jongg table seems less beneficial to the women around it than Chelly’s cohort perceived. Postmodern feminist philosopher Judith Butler suggests that gender isn’t fixed, something one is, but rather it is something one does, a social structure that must be repeatedly “performed” in order to exist. Butler argues that surface acts, speech, gestures, dress and other personal attributes are simultaneously the very doing and the very essence of gender. In other words, it is solely the mundane, repeated acts and stylization of gender within our society that create an illusion of gender. But was this performance really so innocuous – a natural, effortless communication and physical touching around a 34-inch-square table? Even this enveloping feminine association – complete with the fashionable outfits, clicking of tiles, women’s voices – however unintended, perpetuated the rigidity of gender norms that the players were enacting. Did this space give “life” to the players, as Waltman suggested, because of its warmth? Or, by virtue of its prescribed expectations, did it instead serve to reinforce the gender stereotypes of the era? And did the rigid decorum of the living room space itself work against the empowering effect of the mah-jongg table placed within it? And what of the temporary nature of the mah-jongg table, taken down and set up within the course of a few hours? However unintentionally, instead of a site of female empowerment, this impermanence may have further contributed to its being a site of suppression. Stored in a closet for most of each week, the gaming table and chairs were not a permanently established part of the family’s physical space. Unlike the piano, which was rarely used but permanently and prominently positioned in the living room, or the den off the living room for the husband/ father, established for his private use, this women’s space was brought out like the game itself, snapped open for a few hours at a time only to be packed up and hidden away again once the play stopped and women returned to their traditional domestic roles. Contrary to easing their integration into North American society, the tradition of mah-jongg may also have inadvertently acted to stereotype Jewish women. The playing of mah-jongg was no secret, transmitted through various media or even in supermarkets and playgrounds – the way all stereotypes seem to spread. Outside of the Chinese men and women who continue to play, it is Jewish women who have historically been associated with this game. 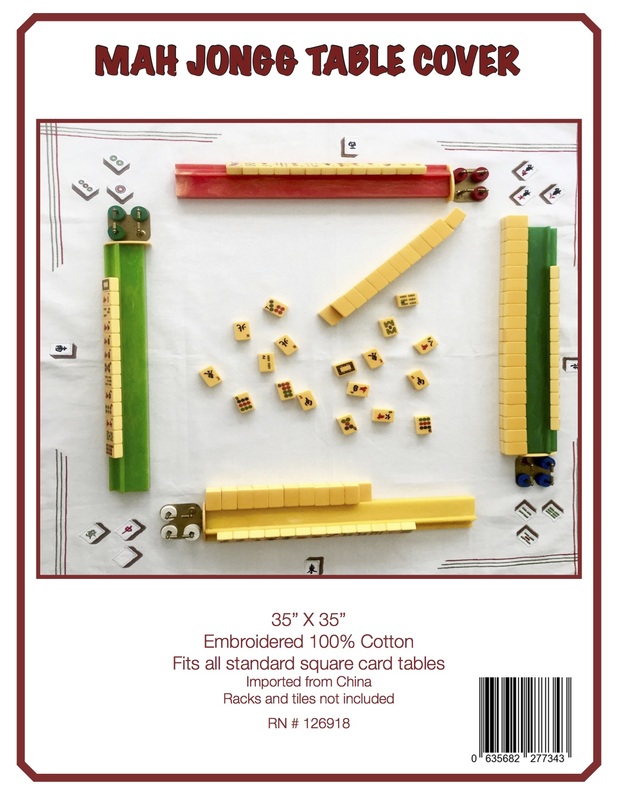 In their book Mah-jongg: from Shanghai to Miami Beach, Christina Cavallaro and Anita Luu inform us matter-of-factly that “The National Mah-jongg League was founded in 1937 in NYC. Some of the founders and many of its longstanding members were Jewish.” As a consequence, the tradition of playing the game in the living room, surrounded by the best furniture and decorative items in the home, may have further reinforced the notion of Jewish women as representatives of a privileged female consumer class with abundant leisure time and a significant disposable income with which to shop: neither of which might be considered a particularly commendable attribute. Within the framework of Judith Butler’s performance theory, the seemingly straightforward and pleasurable pictures of women’s game-playing take on new meaning. Rather than scenes of female intimacy and power, these weekly games might really have been weekly re-enactments of roles those women were socially constituted to play. The irony is that these women’s performances were so convincing that they may only have served to reinforce their own subjugation. When I look back now, I regard the mahj table both with warmth and with suspicion. The first time I met my mother-inlaw she was playing mah-jongg with Ethel, Ruthie, Sonia and Toby. As soon as I walked through the front door with my husband-to-be, I could not miss these women in the midst of their game. Their table was situated in the centre of the living room, directly in front of the fireplace and to the left of the piano. My mother-in-law’s dark green cut-velvet sofa proudly occupied the space in front of the window, with two petit-point arm chairs and side tables on either side. Several of her best pieces of china were perched on the fireplace mantle and her two best paintings were displayed prominently above the chairs. A small silver candelabra was positioned on top of the upright piano. Sitting in the breakfast room nearby, I could hear the clacking and mixing of tiles, the (not so quiet) nibbling on licorice allsorts and bridge mix, snippets of conversation about hairdressers, the significance of my presence, where to buy the freshest vegetables and best snowsuits, and, of course, their children’s achievements.